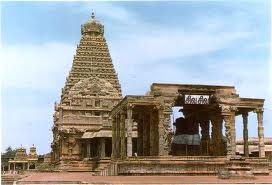 Here is Some Information about Thanjavur Temple in Thanjavur Tamil Nadu. Area : 29.24 sq. kms. 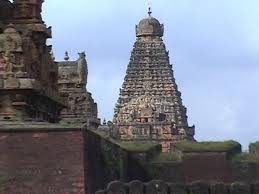 The greatest of Chola emperors Rajaraja-I (985 A.D - 1012 A.D) the son of Sundara Chola (Parantakaa-II) and Vanavanmahadevi built this magnificent temple named Brihadisvaram at Tanjore - the capital of Chola dynasty. 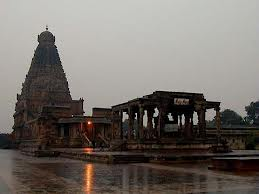 In later period Maratta and Nayaks rulers constructed various shrines and gopurams of the temple. From the epigraphical evidence it is known about Rajaraja-I started building this temple on his 19th year and completed on 275th day of his 25th year. It took just 6 years to complete this work on 1010 A.D.
Rajaraja-I named this temple as Rajarajesvaram and the deity Shiva in Linga form as Peruvudaiyar, the temple is also known in the deity's name as Peruvudaiyarkovil (in Tamil language). 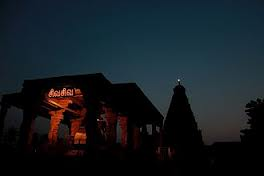 In later period when the Sanskrit language was more popular during the Maratta rule the temple was named in Sanskrit as Brihadisvaram and the deity as Brihadisvara. 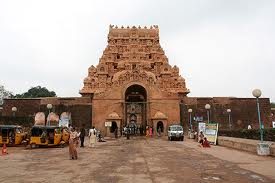 Now-a-days it is also known as Thanjai Periyakovil (Tanjore Big temple). As one approaches the Periyakovil one can see the the beautiful ornamental arched entrance built by Maratta rulers with the huge reddish fort type walls surrounding the temple. The view of Keralaanthakan Gopuram followed by Rajarajan Gopuram and the majestic Srivimana Gopuram covers the whole of retina of once eyes. Sri Thyagaraja Aradhana Musical Festival January. Pongal (Tourist) Festival 14th to 16th January. Arulmigu Thyagarajaswamy Car Festival March. Annai Velankanni Festival August & September. Raja Raja Chola's Birthday Sathaya Thiruvizha October every year. By Road : Thanjavur is well connected by road with all the major towns and cities in Tamil Nadu and also with Kochi, Ernakulam, and Thiruvananthapuram in Kerala and Bangalore in Karnataka. 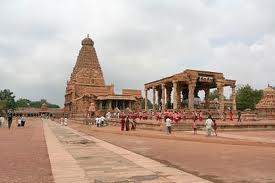 There are regular bus services for visiting all the places of interest in and around Thanjavur. By Rail : The railway station at Thanjavur is well connected with Trichy, Chennai, Madurai and Nagore. By Air : The nearest airport is situated at Trichy which is 65-km from Thanjavur.